Windows 10 is now the most popular computer operating system on earth and there are millions of people who use it as the main workforce. However, there would be some bad time when you forgot the login password, which happens quite common as there are so many things we need keep in our mind. In fact, you don’t need to worry too much. You can actually reset forgotten Windows 10 password in a few minutes without reinstalling Windows OS. Please follow the tips in below. Microsoft is the default account type in Windows 8 and Windows 10. So, if your login password is same as your Microsoft account then you can easily take this to your benefit and reset the Microsoft account password to gain access to your computer. Note: Microsoft accounts are exactly the same replica of your Skype, Outlook, Xbox and other Microsoft services accounts. So, if you are using any Microsoft service then resetting this password will reset all the password of Microsoft services that you are currently using. Step 1. Go to https://account.live.com/password/reset from a separate working computer or mobile phone using your favorite browser. Step 2. Choose “I Forgot My Password” and click “Next”. Step 3. Enter the Microsoft email or phone number associated with it and hit next. Step 4. Select how you would like to receive the one-time password. You can either select email or phone number to receive the security code. Step 5. Enter the security code that you just received and click “Next”. Step 6. 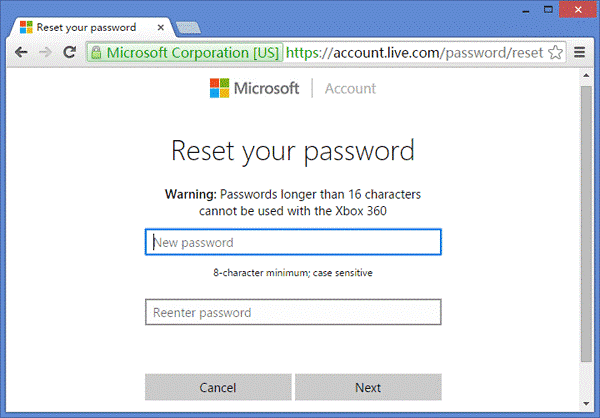 Input the new password for your Microsoft account and confirm the changes. Now, you should go ahead and turn on your locked computer but this time use the new password instead that you just setup a few minutes ago and VOILA! You can enter into your PC normally now. This part is really easy and helpful if you are using a Microsoft account on your computer. 1. It should work perfectly if you are using Microsoft as your default account type. 2. No data loss will occur using this method. 1. Only works in Windows 8 and Windows 10. It is not supported in older version of Windows. 2. Won’t work if you are not using Microsoft as the default account type. 3. Completely absurd if you forgot your Microsoft email or phone number too. Offline NT Password & Registry Editor is a Windows password recovery tool that helps to remove the password from the login screen completely. It is free to use but it requires a certain level of computer expertise to make this work. Step 1. Download the tool from the official website and store it on your computer. You may require using a different working computer for this part to work. Step 2. Plug in an empty USB flash drive to the computer and burn the ISO image file using the default ISO burner. Step 3. After burning the files of Offline NT Password & Registry Editor into the flash drive, take it out and re-insert it on the locked computer this time. Step 4. Since it’s a bootable disk, the computer should automatically load the program upon startup. Step 5. Choose the partition driver in which you have installed the operating system which is usually the primary drive. Step 6. Select the password reset option and if you feel confused then simply uses the default settings. Step 7. Choose the option that states, “Edit user data and password”. Step 8. Input the username (case-sensitive) and select “Clear/Blank Password”. This should completely erase the password from the login screen. Step 9. Type “!” to quit and then select “Exit” to close the program and eject the flash drive. Now, turn on your computer and you should be able to enter into your PC normally without using any password at all. 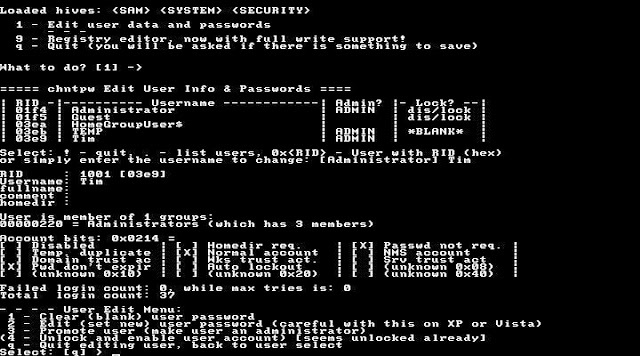 In this brief tutorial, we just demonstrated how to reset Windows password if forgot using countless methods. Please use the suitable tip that is compatible with you. 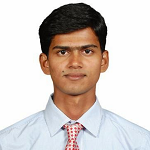 Most methods only work in certain Windows versions but if you are using UUkeys then you can remain tension free since it works in all versions of Windows computers. There are many tools available on the Internet market that promises to bypass Windows password screen but fails every time. UUkeys offers 100% guaranteed success rate that the password will be removed from the login screen completely. If you face any kind of trouble using this tool then you may want to contact the support to get the earliest assistant. Hopefully, you guys enjoyed and found this tutorial useful. Don’t forget to share it with your friends and families on social media.